Agricultural Meteorology is a specialization within the M.S. and PhD. cooperative program with the School of Natural Resources and the Department of Agronomy and Horticulture. The specialization was designed to provide students a unique learning environment to promote understanding of the interactions between the atmosphere and the biosphere in an agricultural setting and to encourage cooperation among the community of scientists and students within the agricultural meteorology research area. Students with this specialization may find employment in teaching, research or applied fields. Possible job titles for students completing the program include: teacher at the secondary level, research project assistant, and atmospheric specialist. 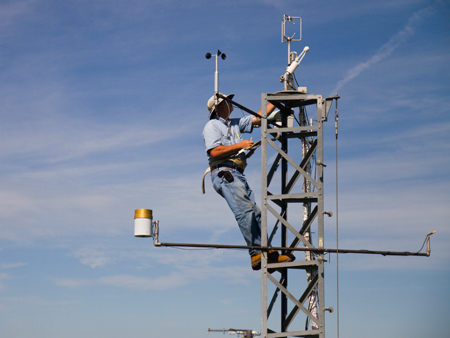 Tom Lowman performs maintenance on the tower eddy covariance sensors at one of the Carbon Sequestration field sites. 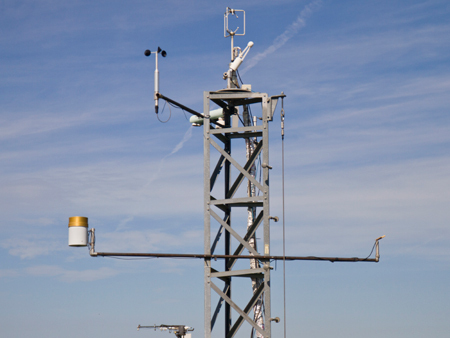 Tower eddy covariance and supporting environmental sensors measuring hourly exchange of carbon dioxide, water vapor, sensible heat, and momentum. Measurements have been collected continuously since 2001 to study carbon sequestration of maize-based agro-ecosystems under different management practices. 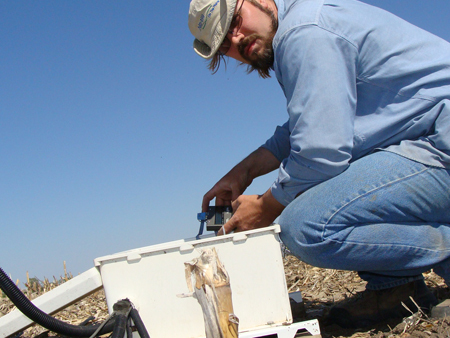 Todd Schimelfenig checks the status of dataloggers collecting profile soil moisture measurements at the Carbon Sequestration field sites. 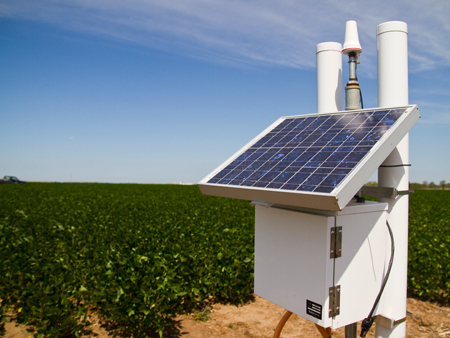 The COSMOS (COsmic-ray Soil Moisture Observing System) soil moisture sensor that measures soil moisture over a 700 m diameter area to a depth of up to 50 cm at the rainfed Carbon Sequestration field site. Greg Teichmeier and Dan Hatch prepare to draw a bale sample for analysis of moisture and carbon content in a biomass removal study at the Carbon Sequestration field sites.